1. 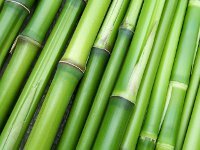 Are moisture meters accurate when measuring the moisture content of bamboo? Bamboo can cause problems for flooring installers when trying to calibrate moisture meters because bamboo does not have a uniform density. Pin meters have been known to work well on traditional bamboo if you insert the pins parallel to the grain of the material and at the same depth. Pinless meters work better with strand-woven bamboo. 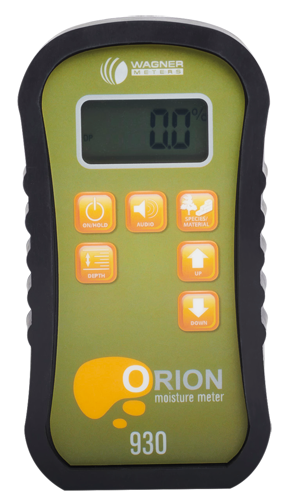 Your flooring and moisture meter manufacturer should be able to provide you with information that will help you accurately calibrate and test the moisture content of the specific materials you are working with. 2. Where can I find the right moisture meter settings for bamboo flooring? Even though standardized grading systems for bamboo flooring are not currently available, Wagner Meters and other moisture meter manufacturers are working with bamboo manufacturers to establish accurate settings. The settings below were located here. *These settings were derived from sample populations of the different flooring products provided by the above manufacturers. These samples were lab-tested for actual moisture content at Wagner Meters using the ASTM D4442-92 oven-dry method. The oven-dry results were then used to establish the optimum settings for Wagner Meters digital handheld moisture meters. 3. Depending on the brand of bamboo, are conductivity characteristics different from batch to batch? It is possible the resin from various species of bamboo (specifically with strand bamboo flooring) will interfere with electrical conductivity. 4. If they are, how do we calibrate our moisture meters to ensure accurate moisture content measurement? 5. Would you say bamboo is more sensitive to moisture than other species? Are different types of bamboo more stable than other types? No. Bamboo flooring has a higher moisture resistance than most solid hardwood flooring materials. Strand-woven is considered to be the strongest of the three types of bamboo flooring and is more resistant to moisture changes because it is manufactured under intense pressure. 6. Are different species of bamboo flooring more sensitive to changes in moisture? There are various factors that affect this material’s capacity to retain moisture. 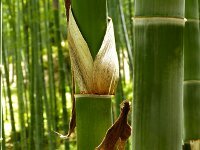 Some of these factors include the region where the bamboo was grown, the age when it was harvested, the directional grain, and the manufacturing process. Strand-woven bamboo flooring is harder than bamboo floorboards with a vertical or horizontal grain, and a horizontal grain is softer than a vertical grain. Strand woven bamboo is considered to be the strongest type of bamboo flooring because it consists of shredded bamboo that is compressed and bonded with adhesives. This manufacturing process helps make strand-woven bamboo more resistant to moisture changes. 7. How do you compensate for moisture sensitivity? It is imperative that you calibrate your moisture meter with the correct adjustment settings from your moisture meter manufacturer. When doing so, always verify the specific product you are working with. Product correction numbers vary with traditional and strand bamboo. 8. What is the preferred environment (temperature and humidity) for bamboo flooring? Because bamboo flooring is hygroscopic, controlling moisture content is one of the most important components for success. Monitoring the home environment and implementing preventive measures will decrease the amount of movement and will increase stability. It’s important to control humidity levels in the building and keep them from fluctuating to extremes. Humidity levels should be maintained within a 40%-60% relative humidity range. Temperatures should range between 60-80 degrees Fahrenheit. 9. What is the strongest type of bamboo available? The strongest type currently available is strand-woven bamboo. 10. What causes vertical obstruction and how does it affect a bamboo floor? Temperature and humidity changes in the environment are known to cause vertical obstruction in bamboo flooring. Vertical obstructions occur when transition pieces are not installed in areas that extend into other areas and doorways. Physical obstructions such as kitchen islands will also be problematic if proper expansion space is not allocated. If transition pieces are not installed, the flooring will not be able to move properly…the movement will be restricted and tension will be placed on joints causing the flooring to pull apart. 11. How can vertical obstruction be prevented? An expansion gap left around the perimeter of the floor and all vertical obstructions, including kitchen islands, will allow and facilitate the expansion and contraction of bamboo flooring. T-moldings are also required to help separate areas because the floor functions like one large piece. This will allow rooms to expand and contract without affecting other areas. It is also recommended that transition moldings be placed in all doorways and wall openings – with or without a door. 12. What is the recommended acclimation period for all bamboo flooring installations, and what steps should contractors take to ensure the acclimation process is adequate? Many installers mistakenly believe bamboo flooring doesn’t need to be acclimated because the pieces are glued together individually. The fact is, even though some floorings consist of many small pieces glued together, they are oriented in the same direction and consequently, expand and contract. Solid bamboo acclimates faster than strand-woven. Solid bamboo usually takes between 3-7 days to acclimate. Strand-woven bamboo acclimates slowly and can take up to 30 days to acclimate to your job site. Ensure job site humidity and temperature are controlled and set to normal living conditions. 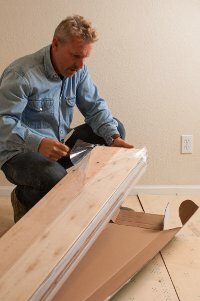 Remove flooring from packaging and sticker-stack the planks in order to facilitate airflow between the boards. Wait until bamboo flooring adjusts to room temperature and humidity. This process usually takes 72 hours, but it can take longer if you are in a region with higher or lower levels of moisture. Bamboo flooring can be installed when the moisture content between the floor and subfloor is within 3%. 13. Are VOCs and formaldehyde a problem with bamboo flooring? No. High-quality bamboo should have low to zero Volatile Organic Compounds, also known as VOCs, and formaldehyde. When selecting quality bamboo flooring materials, ensure flooring materials pass the CARB standards for indoor air quality. VOCs depend on how the flooring is manufactured. 14. 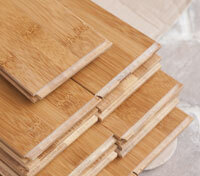 What type of subfloor would you recommend for bamboo flooring? A subfloor of 1 1/8″ plywood over joists at 16″ on center is highly recommended. Bamboo flooring should be within 3% of subfloor moisture content. Concrete must be dry and fully cured (at least 60 days). To help minimize moisture content transfer from the concrete slab into bamboo flooring, a moisture barrier should be applied. 15. What should the moisture content of the subfloor measure prior to installation? The flooring moisture content should vary less than 3% from the subfloor moisture content prior to installation. 16. If the entire floor moves due to shrinkage, you’ve followed the MFG guidelines for wall gaps, but the material still catches a vertical obstruction…who is to blame? Every situation is different, but in order to remain in compliance with the manufacturer’s warranty, it is the installer’s responsibility to accurately check the material upon delivery and to measure and document the site conditions and materials before, during and after installation. It’s important to follow the manufacturer’s guidelines at all times and to immediately report any inconsistencies with the product. 17. What would you say are the most important factors that help ensure bamboo floor installation success? Humidity control is the single most contributing factor to bamboo failure in a home with “appropriate” installation. Using a moisture meter to properly measure MC in flooring and subfloor. Documenting subfloor and flooring readings at different stages. Taking multiple readings: Contractors generally fail to take enough readings. Measurements should be taken and recorded for every 100 square feet of the subfloor. 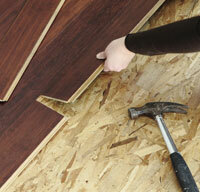 Flooring (40 boards per every 1,000 square feet) should also be tested. An overall measurement can be obtained by measuring different boards from different areas in the stack. Due to the huge variability with bamboo flooring moisture readings, it’s best to obtain accurate information and correction guidelines from your flooring and moisture meter manufacturer to ensure your data is accurate. Do you have a bamboo flooring question we haven’t answered? Please feel free to contact Wagner Meters, and we will be happy to answer your questions. My bamboo floor started to cup about 18 months after it was laid. It is quite noticeable when the light is on it front windows. It has been carefully looked after and is now 3 years old. How do I control the moisture settings so it goes back to original quality? Cupping generally develops gradually and is usually caused by excessive moisture on the underside of the flooring. This can be caused by a number of reasons, such as leaks, damp or wet basements, concrete subfloors that were not allowed to dry completely, excessive moisture in plywood subfloors, poor or no ventilation, or a problem with your HVAC system. Cupping can also be caused by not acclimating the flooring properly (this is generally permanent cupping). Finally, your floor may also cup if there is rapid drying on the surface. Gaps appear as the flooring shrinks. My recommendation is to get a flooring inspector to your home to find the exact cause of the cupping and to recommend a corrective course of action. Inside condition of home 55% RH and 68 degrees F. Moisture of bamboo flooring product at 1/4 inch, using lingo scanner set to bamboo product, had moisture present readings of 6.15 to 11.8 . What do these readings mean and is there a moisture problem?